HubSpot CRM is one of the leading CRM apps currently available on the market and a winner of our Expert’s Choice Award for 2018. Free and simple, HubSpot CRM is built to be a platform that allows sales teams to get started quickly without making much of a change in their existing workflow. It is a solution ideal for companies that are still starting to recognize the value of CRM and want to try it out or for enterprises that are not using their existing CRM systems to their fullest potential. HubSpot CRM is a smart and easy option that carries all the necessary basic features but without the often confusing complexity many other CRM platforms have. Beginners and mid-market companies will also appreciate the fact that HubSpot CRM is currently a certified, premier Google partner, and is a solution that suits well all niches and industries. HubSpot will help you easily create beautiful contact and company profiles, as it can neatly organize every single detail from your customers’ communication with you. It effectively assigns and tracks your deals, controls the performance of your agents, and offers a single, detailed dashboard where all team members can keep track of the company’s activities. If you are already a HubsSpot Sales user you can also use HubSpot CRM for more effective inbound sales. At the same time, HubSpot is one of the best-integrated CRM platforms on the market and no other free CRM solution can offer the same level of integration. Some of the popular apps it integrates with are Microsoft Dynamics, Salesforce, Zapier, Shopify and many other tools. Interested users can also take a look at HubSpot Marketing – an advanced system from the HubSpot suite that will align their CRM and marketing efforts in the service of improved traffic and conversion rates. The system helps develop successful lead generation strategies, primarily by enabling users to optimize their website content and distribute it among the right influencers and audiences. 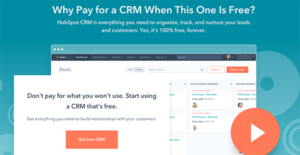 What makes HubSpot CRM a better solution than most CRMs today? First of all, it’s available completely for free. Any business, regardless of budget, can use HubSpot CRM at no cost and integrate it with just as many business systems and applications as necessary. The first and most important advantage of HubSpot CRM is that you can link it to all places and locations where your modernized sales processes are taking place, including your websites, email service providers, social media profiles, phone calls, and more. HubSpot CRM will help you close more deals with less work involved, because it organizes and tracks each aspect of your sales pipeline, and helps you grow it and develop in the right direction. The data insights it provides are simply unparalleled, and will certainly help your agents save time they usually spend on research. You can enjoy as much as 1,000,000 contacts and users, and unlimited storage, all available for free. Unlike what you’d normally expect from a free software system, HubSpot actually responds to effectiveness criteria even better than a variety of paid tools. On top of that, it is also flexible enough to meet the needs of individuals, B2B and B2C businesses, those operating in retail, accounting, real estate, construction, or any other industry. Once installed, HubSpot CRM will run in the background of all tools you are already using, and you will be able to trigger it whenever you need it. The list of available integrations is very long, and includes products such as Pipedrive CRM, SugarCRM, Bigcommerce, Gravity Forms, Base CRM, Google Chrome, Google Dynamics, Snapengage, Dropbox, and many more (see the integrations tab above for a full list). Basically, HubSpot is applicable in any software ecosystem, and blends easily in all processes and operations instead of asking you to modify those to its benefit. As our experts like to call it, HubSpot CRM is a restless and powerful automation system, which will eventually help businesses close deals faster and cut the time they are spending on arranging customer documentation. It also offers some of the most powerful data enrichment functionalities, thanks to which you can import leads from your emails with a single click. Another way in which HubSpot CRM perfects the art of efficient customer relationship management is with fast leads backlog, and the intuitive interface that doesn’t require any training or complex installations to master. Every organization has different needs and needs an application that can be customized for their size, kind of workers and buyers, and the particular industry they are in. For these reasons, no system can proffer perfect tools off-the-shelf. When you search a software app, first be sure what you want it for. Read some HubSpot CRM reviews and ask yourself do you want basic tools or do you need complex functionality? Are there any industry-specific functionalities that you are seeking? Obtain the answers to these questions to aid your search. There are plenty of aspects that you need to consider and these include your finances, particular business needs, your company size, integration requirements etc. Take your time, check out a few free trials, and finally select the platform that presents all that you need to improve your company efficiency and productivity. We realize that when you make a decision to buy CRM Software it’s important not only to see how experts evaluate it in their reviews, but also to find out if the real people and companies that buy it are actually satisfied with the product. That’s why we’ve created our behavior-based Customer Satisfaction Algorithm™ that gathers customer reviews, comments and HubSpot CRM reviews across a wide range of social media sites. The data is then presented in an easy to digest form showing how many people had positive and negative experience with HubSpot CRM. With that information at hand you should be equipped to make an informed buying decision that you won’t regret. Unique but expensive. Commit to spending time and money. Satisfactory and guaranteed implementation on the use of this work tool. What are HubSpot CRM pricing details? What integrations are available for HubSpot CRM? Thank you for nice review, I'm glad to hear that you have been so happy with HubSpot! As far as room for improvement - I would love to hear more about which features of the reporting tool are not as comprehensive as you'd like. The reporting tool is constantly evolving and expanding and we hope to make it as useful as possible! Feel free to send any further details you have to carl@hubspot.com and I'd be more than happy to continue the conversation over there. Thank you so much for your review! I'm glad to hear you have been so happy with the HubSpot platform - it sounds like you are really taking advantage of all the tools it offers. As far as room for improvement - I would love to hear more about your suggestions for social media sharing and adding or deleting contacts from smart lists. For social media sharing, what kind of further tools or abilities are you hoping to see? Are there certain social media platforms you would like to see integrated with HubSpot?